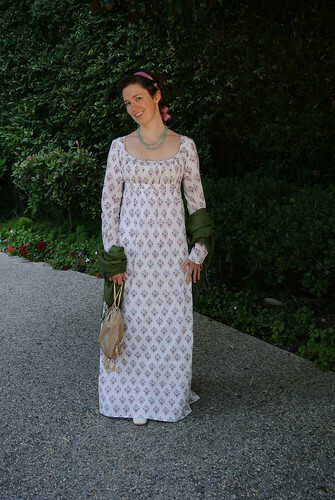 Eventually, I did get dressed in my new block print regency dress. 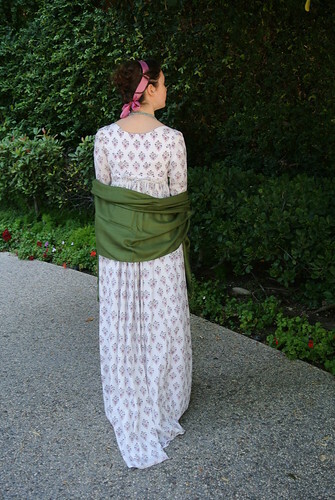 I accessorized it with a green cashmere shawl (because I freeze in air conditioning), an aquamarine necklace that I knotted, a reticule (more on that later), and cream Robert Land slippers. As you may have guessed, I was super lazy about classed on Sunday and only ended up going to Kendra's 18th century hair class. Despite some technical difficulties, I found it very interesting and it got me even more excited for her upcoming book! I feel like a dunce when it comes to hair, so I appreciate any help I can get.